This week my littlest is turning 3 months old? How did that happen exactly?. 9 months in and 9 months until he turns one, time really does melt when you have children. 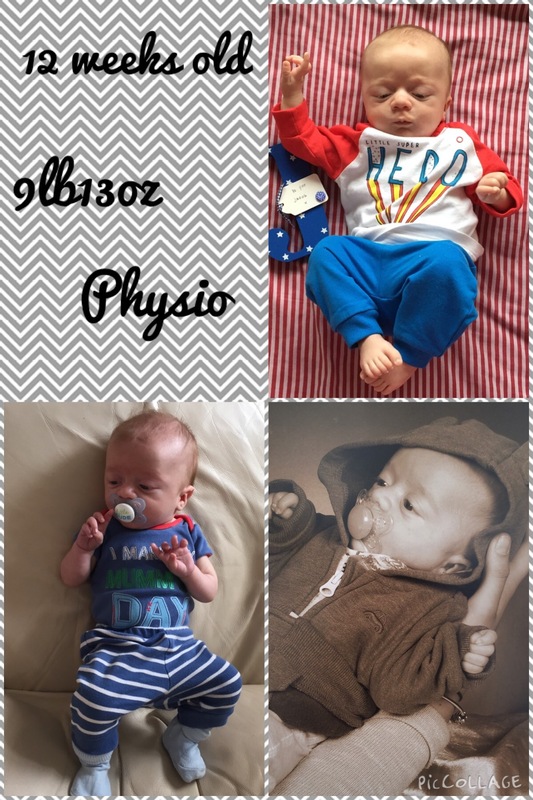 This week Jacob weighs 9lb 13oz, again he is still on the 0.4th centile, as long as he continues to follow his line then we have agreed with his pediatric consultant that he can go back to his aptamil pepti 1 milk as the high calorie milk was just to rich for him. Jacob sow his Physio again this week and she was very impressed with his head control. We now need to focus on tummy time and help bring his arms forward as his shoulder blades across the back are very tight where he hasn’t been cuddled up in the womb. In July Jacob will be getting splints on his hands to try to help open them up as he keeps his thumb and middle finger clenched in, though they do come out he just rarely chooses to do so. Next week Jacob has his second set of immunizations poor poppet. What were your babies doing at 12 weeks old? Let me know in the comments below.